This book features all the ingredients, techniques and traditions of an ancient cuisine. 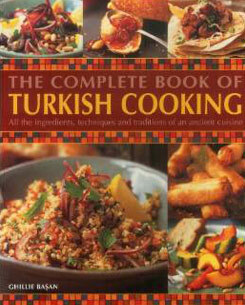 You can discover classic and modern Turkish food and cooking, in more than 150 authentic recipes. You can explore the ancient history, diverse culture and geography of Turkey, from the bustling city of Istanbul to the shimmering coastlines of the Aegean sea. It features a comprehensive visual guide to Turkish ingredients, and detailed step-by-step instructions for every preparation and cooking technique. It includes recipes that range from mouthwatering hot snacks such as Filo Cigars. It is filled with Feta, Parsley, Mint and Dill, and delicious main dishes such as Chargrilled Sardines in Vine Leaves, to sumptuous sweet treats such as Baklava. It includes over 800 specially commissioned photographs. In this exciting and comprehensive book, Ghillie Basan explores the rich culinary history and traditions of the Turkish people, the evolution of their cuisine, and the classic dishes that are known and loved all over the world. The book opens with an introduction to the equipment, ingredients and special techniques of Turkish cooking, with preparation and skills all shown in step-by-step detail. The recipe selection offers simple classics such as Spicy Red Lentil Soup with Onion and Parsley, Cop Sis (lamb kebabs) or Rose Petal Sorbet, or the chance to experiment with something more unusual, such as Chargrilled Quails in Pomegranate Marinade or Plum Tomato and Almond Jam. Packed with information, tips, inspirational dishes and over 800 photographs, this is the essential cook’s kitchen handbook, a practical guide, and recipe sourcebook for Turkish cuisine.